I am using a uTOLED-20-G2(Transparent one) and need to be able to send images/text strings etc. to the display using Arduino Mega. What's the simplest workflow? I've tried the library shipped with the 4D composer but they seem to be not working. The blink runs fine with Just the arduino. But as soon as I connect the display it doesn't work and throws error- Timeout. Do you guys know what I might be doing wrong? So I finally was able to connect and get the sample code up and running on my TOLED. My next question is how to send live data to it via computer? e.g. reading of live weather off web and pushing it to the display. OR Printing an image off a URL to the display. I'll let the arduino and display connected to the computer. Are there any tutorials on how to use Arduino and 4d display for that? I presume you want to program that all from your Arduino. BigDemo has examples of all the commands you would need. Yes, i saw the examples. 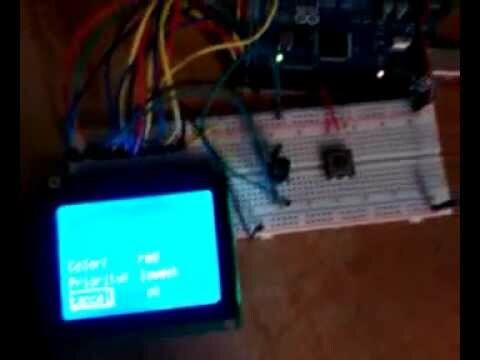 I had success in modifying BigDemo code and burning it onto Arduino to see graphical/text results on the screen. works great that way. -But how do I send live-instructions from Arduino IDE/computer to the screen in the same setup? Any examples/demos of that? e.g. Type X on computer, and X is displayed on the OLED. I hope you understood my question. Experienced with programming but new to Arduino/electronics here. Um, I must be missing something here, why not just attach the computer to the display and dispense with the Arduino? You could then write in your favourite PC language (maybe, there are PC type libraries for C and Pascal) and grab the stuff off the internet and send it to the display. So, what's happening right now-> I am able to modify BigDemo code, and publish it to Arduino and hence see graphics right now. What I want to do-> Be able to change graphics on the OLED without 'Uploading to arduino' each time. e.g. I do this on Serial Monitor or some console: Putstr("Hello there"); // it should update instantly without the need to Upload the whole code on Arduino . The changes on the screen are happening without compiling and uploading the code each time. That's what i mean. Well, you just need to make your ardiono code 'smart'. Simplistcally if you were to read an analogue value you could have it continuously update the display and it would only need uploading once. Any examples or general-workflow you suggest on how to interface Processing and the OLEDs? I guess that's the way to make it smart, since Arduino IDE itself can't do 'sound processing' 'webpage parsing'.